Funny Engagement Card Messages: Have some friendly banter when you say congratulations to a couple who has just got engaged. Whether it is your best friend, brother, sister or colleague, congratulate them by writing a humorous quote on a greeting card. Take ideas from this post to make the most of this once in a lifetime moment. Tag the fiancé and fiancée on Facebook or share some of these hilarious wishes with them on Pinterest. These might be the perfect jokes for your engagement speech. Humor – the best way to kick off a couple’s journey to becoming husband and wife… happily ever after. 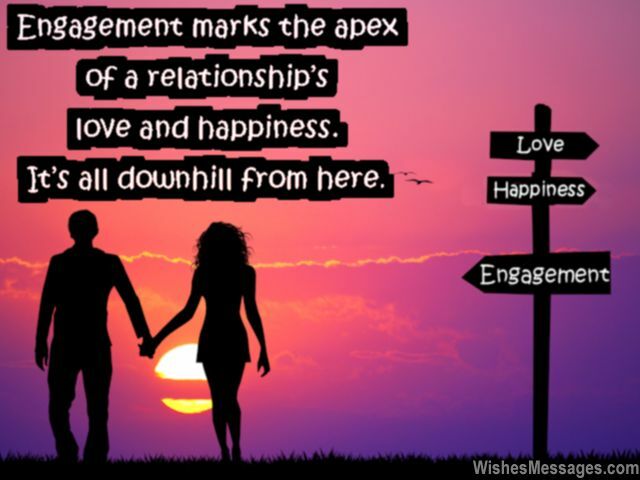 1) Engagement marks the apex of a relationship’s love and happiness. It’s all downhill from here. Congratulations. 2) Technically and traditionally, engagement is known as the promise to marry. But practically it is known as the promise and first step to lifelong slavery. Congratulations. 3) There are two types of couples. 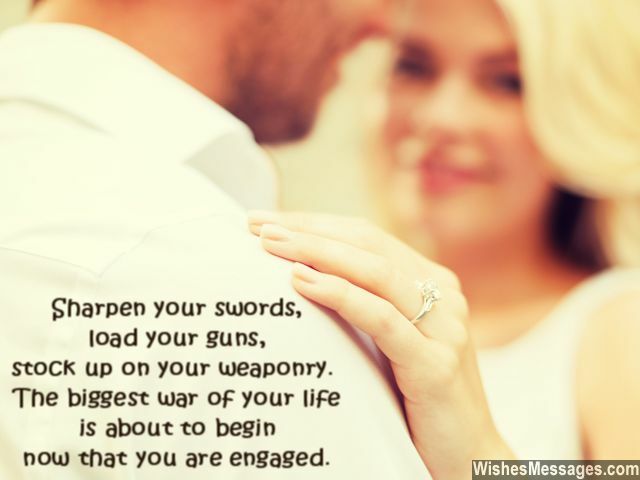 The first type is the couple who fights and argues after getting engaged. The second type… is yet to be discovered. 4) You are lucky to have found your perfect match in each other. I don’t think anyone else could have tolerated either of you as their life partners. Congratulations on your engagement. 5) Getting engaged is like putting a down payment on a mortgage which you will be a lifetime liability. Congratulations. 6) There are two ways to get jailed for life. One is to commit a bad crime and the second is to get hitched. Congratulations for choosing the latter. 7) In disguise, an engagement is the funeral of peace and the birth of chaos in a couple’s life. Congratulations. 8) When you started dating each other, you made a promise to be girlfriend and boyfriend. When you became committed, you made a promise to love each other. Now that you are engaged, you have made a promise to marry each other. Aren’t you tired of making so many promises again and again? 9) Congratulations for getting engaged. Your love’s bubble bursts now. 10) Congratulations for finally getting the right to officially annoy, irritate and frustrate your partner for the rest of your life. 11) The bachelor brigade has lost one of their own. Congratulations to you buddy, but we are mourning the loss of a fallen soldier. 12) I promise to smile at your engagement party but deep down inside my heart is weeping because I feel sorry that you have lost all your freedom. Congratulations for getting engaged. 13) Congratulations for getting engaged. How does it feel getting handcuffed? 14) Finally you have found the person who will tame your eccentricities, curb your idiosyncrasies and make you a more civilized person. Congratulations on getting engaged. 15) More responsibility, more accountability, more dependability, more answerability and more commitment – what part of being engaged sounds fun to you? 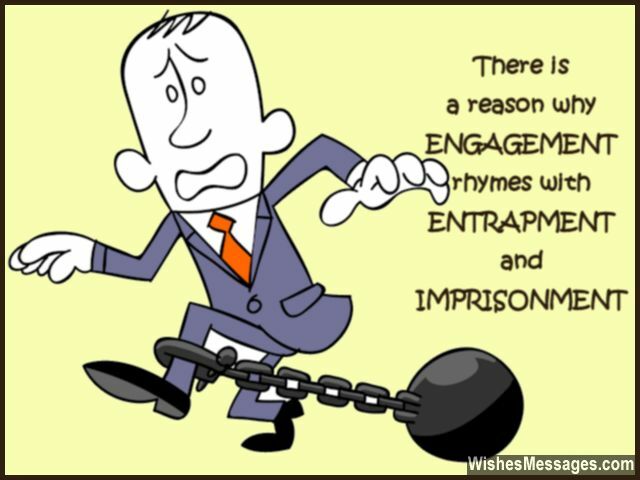 16) There is a reason ENGAGEMENT rhymes with ENTRAPMENT and IMPRISONMENT. 17) Do you know what late night parties and hanging out in friends have in common? They will both disappear from your life, now that you are engaged. Congratulations. 18) Did you know that Engagement is just a promise to get married? Don’t let down your guard yet and keep up all your efforts to woo him until he puts a wedding ring on that finger. Go girl. 19) Congratulations for getting engaged. Now let’s mourn the demise of FUN IN YOUR LIFE. 20) Engagement… the point when the woman will stop worrying about makeup and the man will stop worrying about holding his belly in. Congratulations. 21) One of the rules of a successful engagement is to always imagine a big label titled FRAGILE on your fiancée’s head. This will help you remember that you must handle her with care. Congratulations. 22) Congratulations for getting engaged. None of us thought you both would make it. 23) It is believed that the shine and glitter of a fiancée’s engagement ring should equal the amount of love her fiancé has for her. So you better not cut corners this time, cheapskate. Congratulations mate. 24) The biggest challenge of being engaged is to find each other as adorable and lovable after your engagement, as much as you did before it. Good luck. 25) Engagement… a reason to stop putting in effort to look good for each other. Congratulations. 26) People celebrate when they get out of prison. But you are celebrating the fact that you are turning yourself in, for life. Congratulations nevertheless. 27) Cupid took too long to get you both to slip engagement rings on each others’ fingers. Better late than never, I guess. Congratulations. 28) Engagement party, bachelor party, wedding party, anniversary party, kid’s birthday party… wow, your engagement seems to mark the beginning of endless partying. I can’t wait, congratulations. 29) Being your childhood friend I know all your good, bad and dirty secrets. You better host a luxurious and special engagement party for me or else I will tell your fiancée everything. Congratulations mate. 30) Congratulations for getting engaged. Now you will be paying for two tickets to see one movie. 31) Sharpen your swords, load your guns, stock up on your weaponry – the biggest war of your life is about to begin now that you are engaged. Congratulations. 32) Who cares about your engagement? I can’t wait to go shopping for your wedding gown with you as your bridesmaid. Congratulations. 33) Many years ago, Neil Armstrong said ‘That’s one small step for man, one giant leap for mankind’ Today, I say ‘That’s one small step of engagement, one giant leap in frustration and disappointment in my buddy’s life’ Congratulations. 34) I hate you because you both look perfect together… making all other couples look dull and boring. 35) Have you ever wondered how a car salesman behaves after he clinches the deal and gets the money from the buyer? His behavior changes from charming and helpful, to rude and least bothered. Well my dear friend, that deal in your life has been clinched today. Congratulations for your engagement. 36) There is a reason why the word Engaged also means Busy. Now you can officially ward off your friends and family from disturbing you because you are ‘engaged’. Congratulations. 37) Congratulations for getting engaged. But is your love so superficial that you need to buy such an expensive ring just to prove it? 38) Finally… you have a reason to get pregnant. Congratulations. 39) It is not an engagement. It is an agreement to die together. Congratulations. 40) You are now officially under the illusion that you are on your way to spending the rest of your life happily ever after. Congratulations.